Symptoms:The following symptoms have been reported after ingestion of cougette: Oral allergy syndrome, urticaria, angioedema, nausea, diarrhoea, pruritus (Reindl et al. 2000) , (Vieths et al., 2002) . Prick-to-prick-testing with raw zucchini and skin prick test with different commercial extracts, including , latex, and birch, ragweed, and grass pollen (Reindl et al. 2000) . Food/Type of allergen:Low temperature extracts (Reindl et al. 2000) , (Vieths et al., 2002) . 4 (Reindl et al. 2000)  (Vieths et al., 2002) . All patients were positive in the zucchini EAST, with one class 3, two class 2, and one class 1 result (Reindl et al. 2000)  (Vieths et al. 2002) . Immunoblotting separation:Proteins were separated by SDS-PAGE under reducing conditions following Laemmli's method  (Reindl et al. 2000)  (Vieths et al. 2002) . Reindl et al. (2000)  and Vieths et al. 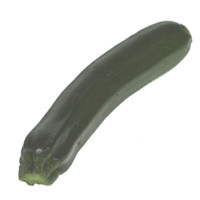 (2002)  observed by immunoblot inhibition that IgE from 1 zucchini allergic individual reacted to a non pollen-related allergen in zucchini whereas the other 3 had IgE to the cross-reactive carbohydrate epitopes (CCD) and/or profilin. Reindl J, Anliker MD, Karamloo F, Vieths S, Wuthrich B. Allergy caused by ingestion of zucchini (Cucurbita pepo): characterization of allergens and cross-reactivity to pollen and other foods.